In January, I was blessed by the opportunity to take a two-week social media break. It was hosted by "The Sunflower Gals", an Instagram account created by Abby Rose Nichols and Abigail Pierce. Each day, one of them would send out a devotional, which sometimes would include a challenge and/or a song recommendation. I really enjoyed taking this break, and today I'm going to be sharing some great things I carried away from it! 1. You don't have to be a slave to your body's every desire. This may seem obvious, but it's very important. Many people are slaves without even realizing it. They'll get a desire to check social media, and they will without even thinking about it. Now I'm not saying it's wrong to check a social media account. But if you know should be doing something else, you can say no to yourself, even if you really want to check it. Social media can often become an obsession, but you must not let it. 2. You have more time than you realize. If you are like me, than you probably feel like you don’t have enough time to do everything. But taking a social media break really showed me that I have a lot more time than I thought I did. When I would get an urge to check Instagram, instead of doing that, I would often do something that I would be happy I did later. 3. Life is exciting! During a social media break, when you are ready to enjoy yourself, instead of sitting down to waste time, you’ll start brainstorming other ideas to do. Maybe you’ll decide to write a book, or maybe you’ll want to deep clean your room, write a letter, or sew a dress. There are so many options! 4. Social media breaks help you focus on what’s important. Often, I find myself living in a blur, not really focusing. Sometimes I’ll just scroll through social media because I’m bored, or upset. When taking a social media break, on the other hand, you’re often purposely trying to be productive, so you are focusing on moving forward, whether in school, music, writing, or life in general. 5. Social media can cause envy. Because social media sites are where people post about the highlights of their lives, it often creates envy. It can make you long for someone else’s life, and make you unhappy with your own. Envy is sin; God commands us to not envy right in The Ten Commandments. Taking a social media break and focusing on your life can remind you of the many blessings you have received. The Sunflowers Gals host a social media break every month, usually one week long. Here is the link to their Instagram: @thesunflowergals . 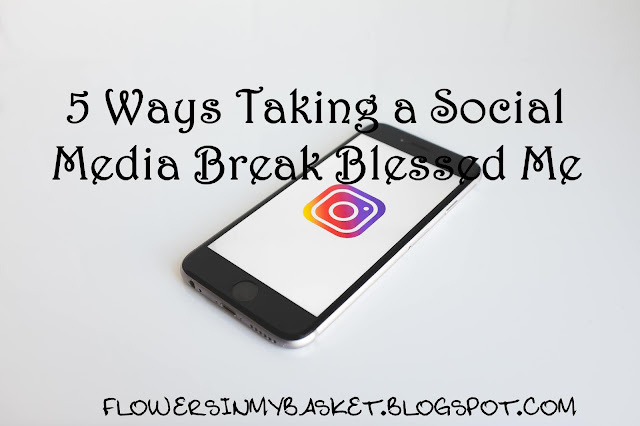 I encourage you to try a social media break too! You can sign up and do one hosted by The Sunflower Gals, or you can simply take one on your own. Have you ever tried a social media break? Please feel free to leave a comment! But if you do, please make sure it is honoring to God. Thank you! Hello! My name is Laura, and I'm the writer behind Flowers In My Basket. You'll find recommendations, stories, devotionals, and more here. Stay and take a look around!